1. 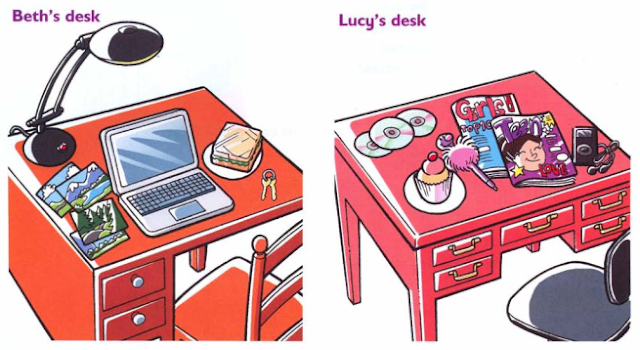 Observe as imagens e complete as frases com: there is, there are, Beth's desk, Lucy's desk. __________ a fairy cake on _____________. There is a fairy cake on Lucy's desk. a) ________ a sandwich on ______________. b) ________ two keys on ________________. c) ________ three CDs on _______________. d) ________ a laptop on _________________. e) ________ an i-pod on _________________. f) ________ two magazines on ____________. g) ________ four photos on ______________. h) ________ a lamp on __________________. i) ________ a pen on ___________________. 2. Complete com is there ou are there. Veja a imagem do exercício 1 novamente e responda às perguntas.